Paperwork often seems to hurt more than it helps. Waiting for it all to be tracked, signed, filed and archived can slow business to a crawl. But while the need to sign off on paperwork can’t be eliminated, it can be enhanced – and made electronic. 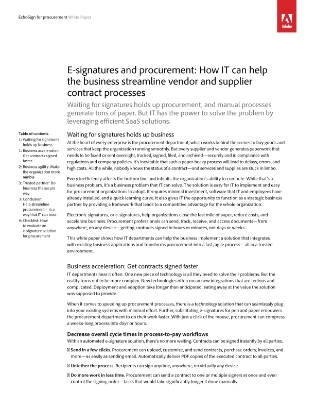 This white paper shows how IT departments can implement an e-signature solution that will cut down physical paperwork and increase efficiency. Read it now to learn how you can transform paperwork into a fast, agile process.